The LOLC Group and Sagasolar Power (Private) Limited (Sagasolar) opened the first ever Utility Scale Solar Power plant in Sri Lanka in Baruthankanda, Hambantota, It has the capacity to produce 10 megawatts of power that will be supplied to the National Grid. The project is collaboration between the LOLC Group and Faber Capital Limited, the key equity providers and other minority partners have invested Rs. 2.6 billion for the project. The project debt is 70% financed by a banking consortium experienced in renewable energy projects, with DFCC Bank taking the largest exposure followed by Commercial Bank and Hatton National Bank. Speaking to Daily News Business he said they will also invest more towards solar energy. “We will also invest in smaller units targeting the households sector,” he said. This project, the first of its kind by the private sector, is over seven times the size of the largest Solar project in Sri Lanka at present; which is the 1.3 megawatt pilot project owned and operated by the Sustainable Energy Authority, in Hambantota. 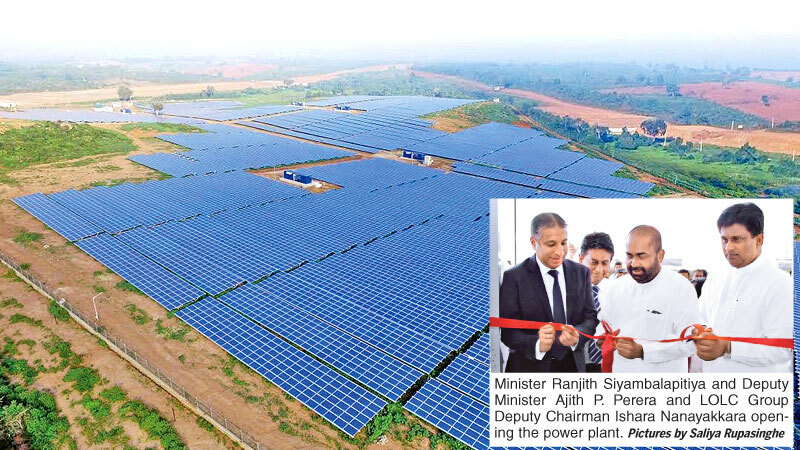 The 10 megawatt Solar plant, has been built on 45 acres within the Energy Development Area declared by Gazette in 2011 under the Sri Lanka Sustainable Energy Authority Act with all necessary environmental and other approvals. The project has 48,000 solar panels which were being made in Solon International, Dubai and is sufficient to provide the annual electricity needs of around 15,000 Sri Lankan homes. The project will also reduce carbon dioxide emissions from power generation in the national electricity system by a margin of 11,000 tonnes per year. Faber Capital Managing Director Dilshan Hettiaratchi said Faber Capital invested in this landmark project over a year ago and combined the implementation and financing elements required to complete the project. “We hope this project will be a catalyst to popularise energy generation through Solar Power, which is arguably the most sustainable green resource available in the country,”he said. Faber Capital Limited is a boutique investment bank which specialises in the implementation and financing of renewable energy projects in Asia, Africa and the Middle East.